We encourage our customers to place orders online. We strive to keep our website informative and up to date. Our powerful online storefront covers the sales aspect of each product including pricing, options, shipping, and checkout information. Before ordering, we always recommend you read all available product descriptions and technical information. The products we manufacture and sell are considered modifications to your vehicle and should always be treated as such. Using our secure online ordering system we accept Visa, MasterCard, Discover, American Express, and PayPal. When paying with PayPal, you will be taken to PayPal's website to complete your payment. After paying for your order PayPal will automatically re-direct you to our website. This step is very important. If the PayPal page hangs up, click the link provided to manually return to our website. If this step fails, your order will be considered incomplete by our shopping cart system and will cause some confusion. If you do not receive an order confirmation within 24 hours your order probably failed to complete. We also accept personal checks and money orders on an individual basis. Please contact us via email for an order total. When emailing us, please be as specific as possible and list the products you would like to purchase. We will respond with a total price and payment information. At 42, we believe in honest shipping rates and no hidden fees. Unless an item is specified 'free shipping', shipping will be calculated exactly by package weight, dimensions and destination. When placing an order you will be able to choose the shipping method which best suits your needs. Default shipping will be calculated by the rate chart above. You will have the option to choose any method better than default. Flexible shipping options are also important if you live on the other side of the US. 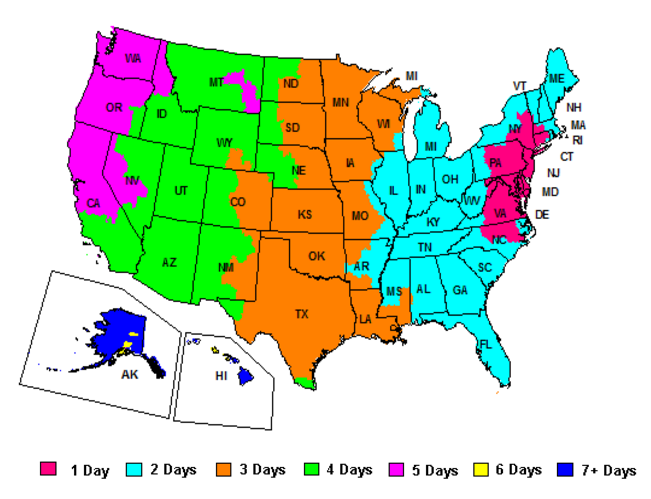 For example, if you live in California your default shipping will be FedEx Ground. You may choose USPS Priority Mail at a similar shipping rate. 42 is located in MD, so a Ground shipment to California will take 4-5 days to arrive. USPS Priority Mail takes 2-3 days to arrive. Transit times are completely dependent on your location. We have listed the basic transit times of our shipping methods in the table above. USPS transit times are loosely quoted. It is not uncommon for a USPS shipment to take a few extra days. The more organized your local postal service, the better. FedEx and UPS transit times are typically very reliable. You may reference the following ground maps to estimate when your order will arrive. Faster shipping options are also available. You may choose expedited shipping when checking out. Rates are calculated based on package weight, dimensions and destination. Please Note! Always double check your shipping address. If you provide 42 with a bad shipping address your order may not arrive on time and/or may be returned to sender. 42 is not responsible for additional shipping costs associated with shipping an order twice. Email is important! We use email to send order confirmations, receipts, backorder and shipment notifications. Be sure to provide your correct email address. If you use any kind of spam filter please authorize emails from sales@42draftdesigns.com. When you place an order with 42 using our online storefront, an order confirmation will be sent to you by our online storefront. Once your order is in our main system, you may receive an additional order confirmation, a receipt, or a backorder notification as needed. Once your order has shipped, we will send you a shipment notification with tracking number and tracking instructions. As always, email is the best way to get in touch with 42, however we are also available to be contacted via our Live Chat and Phone Lines during normal business hours. Email can be answered by multiple staff members at any time during the day if and when we get behind. Emails are normally replied to within 24 hours. Monday is our busiest day, so expect some delay in response when sending emails Saturday through Monday. If you have any questions whatsoever, feel free to contact us. Communication is key to a positive and successful transaction. Prior authorization is required before returning any merchandise. No returns will be accepted after 30 days or without an RMA number. Returned merchandise must be in re-sellable condition or a restocking fee will apply. Special orders, electronic, or electrical items may not be returned. To obtain an RMA number please email sales@42draftdesigns.com with your specific request. The international marketplace is more difficult to service than the North American marketplace. There are situations where ordering directly from 42 will be cheaper and faster than ordering through a dealer. Due to variances in currency exchanges, customs fees, import duties and taxes, the actual cost of an international order can vary in enormous amounts. In cases where ordering through our international dealer network is significantly more expensive or quality of service may be compromised, we will ship international orders direct. However, the following rules will be followed by 42 staff with absolutely no exceptions. USPS has proven to be inconsistent and unreliable with international shipments. Transit time is completely out of our hands. In the past we have had USPS international shipments take anywhere from one week to 4 months to arrive. We are not responsible whatsoever for USPS transit times. If you are hesitant to use USPS, please contact an international dealer to place your order. All international order requests are handled on an individual basis and naturally take more time to process and ship than domestic orders. If you are interested in placing an international order please email us at sales@42draftdesigns.com with your detailed request. Once your order is finalized we will provide shipping rates and payment options via email. Don't be surprised to find that shipping to your country is expensive. We absolutely insist that orders over $50 be shipped via FedEx. These methods of international shipping offer fast, reliable shipping that can be tracked. We refuse to use USPS to ship international orders. Due to lack of tracking, customs delays, and completely inconsistent service we will not use USPS to ship anything of value. We will never compromise our service to save the customer money. If you are shocked by the cost of shipping or unsure of your country's import duties, taxes and customs fees please give our international dealer network the chance to quote your order. As you’re browsing our website you’ll find each product’s availability clearly stated to the right of the price. In the screenshot below we’ve highlighted this area in red which is present on every product listing. On the far right, next to the stated availability you’ll find a red link to this page. Here we explain in detail what each lead time means and in some cases why. To learn more, find your lead time below.